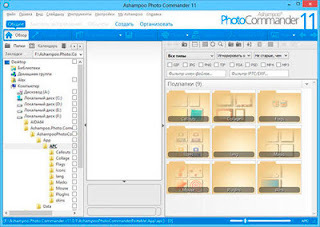 SAGITA COM - Ashampoo Photo Commander adalah universal set alat untuk bekerja dengan gambar digital yang akan membantu Anda mengatur dan melihat, mengedit dan meningkatkan kwalitas foto Anda. Selain itu, juga dapat menambahkan bingkai, mengedit foto, membuat kartu ucapan, tampilan slide, membakar foto ke CD / DVD atau mengupload di berbagai situs media online, dan banyak lagi. Advanced Photo Search sub-folders, and according to EXIF / IPTC information. Built-in wizards for novice users. Create a slide show with sound. Create collages, calendars, cards and photo frames. Create web albums for publication on the Internet. Display detailed EXIF / IPTC Photo Information. Edit photos using unique tools. Editing objects and the use of layers for editing. Enhanced thumbnails images compressed without loss of quality. Installation photos of top rated on a five-point scale. Merge multiple photos to create unusual effects. Multilingual support, including the Russian language. New screen capture technology, including the seizure of unusual forms of windows, Vista Aero Glass effects, etc..
Save images in the PDF file. Sending pictures by e-mail as a PDF file. Support for sorting photos by rating. Supports over 60 media formats, image, audio and video files. Tools recording drives CD / DVD. Use quick tools for common operations with a couple of clicks. Using skins for the interface.